Gita — Is a Song. A song of spiritual knowledge, dialogue between the Guru (Sri Krishna) and the sisya (Arjuna). This dialogue (between man and god) is from the Epic Mahabharata. There are many Gitas (vidura-gita, rama-gita, hamsa-gita, guru-gita and siva-gita but most are only aware of Bhagavadgita. It has been a universal book of guidance. Because it deals with universal issues of life — relevant at all times. It was also described as the “battlefield of life” and with examples. Gita shows three main paths to the divine — the path of action (Karma Yoga), The path of devotion (Bhakti yoga) and path of knowledge (Jnana-Yoga). It’s 18 chapters and 700 pearls of wisdom was created by veda vysa. It is the largest epic in th world. What does not exist in Mahabharata does not exist anywhere — root of all emotions and concepts. Lord Ganesha agreed to be sage Vysa Muni’s scribe on a condition. Gita can be considered as both upanishad and as well as yoga sastra. Each and how it is considered both is elaborated. Upanishads discuss knowledge about absolute truth and essential oneness with it. Sastras are practical ways to guiding us how to attain truth and live fulfilled lives. Yoga means to unite with the Higher. Note — Finally a meaning for “yoga” that I can agree with. First chapter is called Arjuna visada-yoga. Arjuna’s grief became a trigger of his transformation. Gita has been looked upon as Dharma-grantha, Pramamana -grantha, and adhyatmika-jnana – grantha, bhautika-jnana-grantha, marga-darsaka-grantha. This was elaborated with examples. Famous National leaders such as Lokamanya Tilak and Mahatama Gandhi turned to Gita for guidance. Mahatma Gandhi said, he has come to use it for guidance and it has never failed him. Guruji Swami Chinmayananda 🙂 Calls it Art of Man Making. Place of Gita in HIndu Scriptures. Sruti’s are knoweldge realized by the mantras. Example — the four vedas. Considered the fundamental source of Hindu Thought. Smirti — Based on experiences and realization of the truth —- example Gita. Chapter 2 text 7 — a very good verse on qualities of a good student. Moving on with the highlights of lesson one…. Mahabharata is not just family feud between the cousins padavas and kuruvas for the Kingdom but also a war between dharma and adharma — between good and evil. And what own blood kith and kin is capable of. It is believed Arjuna was 60 years old when he heard Gita. Lived for 120 years. Learn in Childhood the verses of Gita. In teenage years it’s word meanings; in youth it’s importance and in adulthood — through satsang, study, reflection and practice! There was more to lesson one than what was mentioned. My lesson one alone was 80 pages. I choose and mentioned what was important to me. Bhagavad-Gita and how it can help bring inner transformation to your life. I don’t know where to start and how truthful I should be about my experiences. I always have been taught by my grandparents and in my Hindu upbringing that truth is God. I moved from India to United Sates when I was 10 years. I grew up with grandparents mostly who were semi religious. Grandma always did her puja and Grandpa always read books and especially books from the Vedanta society. My parents are not religious people. I have never seen mom do a puja. I have to admit maybe just once or twice. Nonetheless she believes in God and went to the workshops offered by the Isha foundation. She knows that I am spiritual person and so she was making efforts for me to join but It did not appeal to me because my challenges were elsewhere. I was more interested in knowing my religion that I never really knew while growing up. None of my questions related to religion or culture were ever answered thoroughly. It was always I think this might be why or we just do this because that is how we have seen it done. 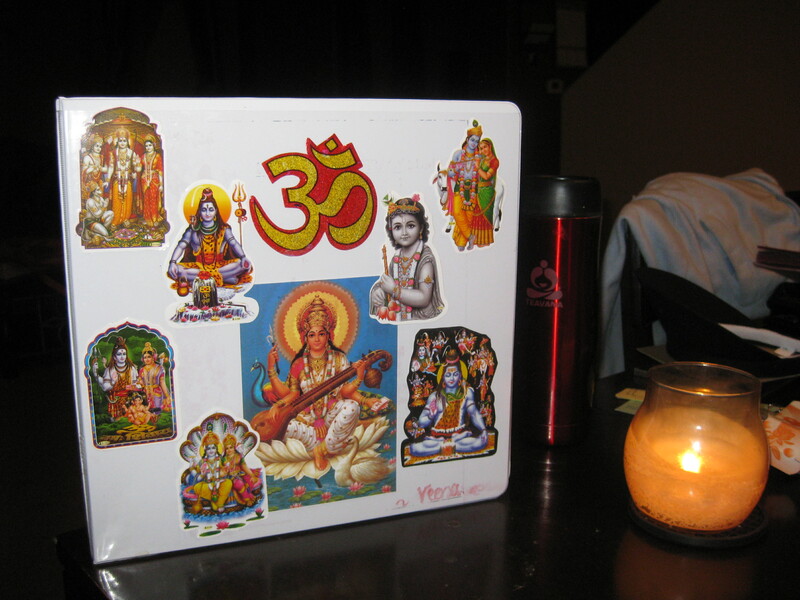 My passion for Sanskrit, Hindu Religion and Religion and spirituality, I hope will one day be my ritual. I want it to be my Yajna. I picked up my first Gita about 10 or so years ago. I went through some tough times in my life. I looked to books for inspiration to carry me through my journey. I am now 33. I searched answers in Hindu religion and text. I have spent the last ten years turning the pages trying to make sense of the Sanskrit. I wanted to and was trying to read Sanskrit — a language I never studied but looked so very familiar. *sigh* What I am I to do when I am really drawn to Sanskrit. It is not very common for people who turn to Gita to always read the Sanskrit. When I read the Sanskrit the English translation and purports (or elaborations) of Prabhupada, nothing made sense. It was not Hinduism I knew it to be. I do however have to acknowledge Isckon for being friendly and helping to answer my questions. The Sanskrit was speaking to me in a bigger way. Things have happened in the last few years that I can honestly and truthfully say God’s with me. My tears are not a witness to my truth. I have experiences that I cannot fully explain to a human being because it is not practical. I have taken up an interesting desire for translating the text —it is uncommon and might be under people’s judgement. As I finished my lesson one of the Gita Course, I just sat there for a quite a few minutes moved by how much I just learned in lesson and how much I respect the roots of the knowledge of where I come from. I do not know what or how people may or may not judge my work and I don’t it’s purpose. I have come to realize though that this is my karma and I hope it will be fruitful. I can truthfully say God/spirits are with me. Recently, I have also been able to SEE things with my consciousness. I have seen the written out symbol of OM in blue, Trishula and things that I don’t fully understand. 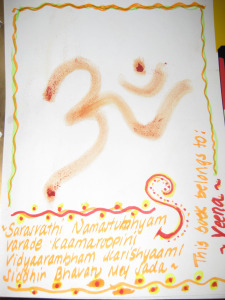 I have also this last Navaratri festival (2011) was a witness to lot more things —- with my consciousness. A humble telescope, a vision of the universe. It was a feeling I cannot explain. It’s like how could I see that…. and an extra ordinary power. I was left with something heavy in my hand and a pen? I don’t think my body fully understood what took place. I have never seen God with my naked eye — I am yet to witness that. Maybe that is what needs to happen for people to see the truth in what I am saying. This was the most “practical” way I could describe my experiences since that was asked of us in this course. We do make choices in life and to believe this or not believe is up to you. With that said—- what would an acharya treat me like once they know of this or me? Let me tell you, the same or no less or no greater the others. I have not yet met one I wanted to show my respects to wholeheartedly. I have seen how some Swamiji’s respond to their disciples, and it’s not very nice. That is probably one of the reason I am weary of approaching someone. Simply for this reason, the ones I have witnessed talk down to their disciples. Now, why don’t Hindu’s treat other like we each have a atma? I have really come to admire the Chinmaya organization for what I have seen online. I hope the organization, acharyas, and the Guru see the truth in my words during the journey of this course and guide me through studying Gita so that I can apply it in my life and conquer my challenges.